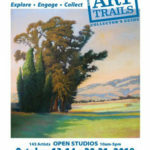 The studio will be open again, this coming weekend as part of the 2012 Sonoma ARTrails Open Studios event. Come visit on Saturday or Sunday to see new works on display. ← Don’t forget. Open Studio starts tomorrow!